Great ju jujitsu and muay thai gym. Instructors are awesome and truly want to you improve your skills. I feel like my skills and overall game improve every time i train here and look forward to what i will accomplish in the future! I’ve been going to Radius for about 4 months now. The quality of instruction and sense of community is something that brings me back and can’t be replicated easily. I would highly recommend checking this place out if you’re interested in BJJ, Muy Thai, MMA or if you’re just trying to figure out something new and exciting to do. No egos here, just drilling and rolling. I began my BJJ journey 6 months ago from today. Despite having no prior MMA or wrestling experience, the instructors at this gym have shaped me into a warrior. Every class is a new experience. 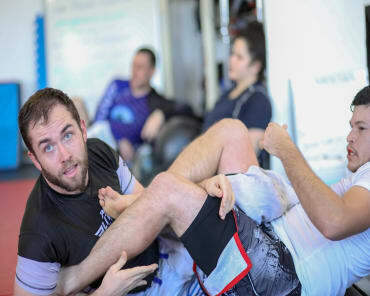 It begins with a technical session that leads you through a set of small moves to create one large strategy, with every step broken into digestible bites. Classes aren’t too big and you’ll constantly receive the one on one attention you need to succeed. Your fellow classmates are pretty chill and easy going but provide the knowledge and strength to push you past your limits. Whether you’re looking for a fun environment to lose weight, trying a new hobby or you’re trying to seriously compete, you’ll find all those things and more at this gym. The Muy Thai classes are pretty awesome too.